2005 was a great season; in fact, with series such as A1 (with Stand 21 being the medical team's partner), the Monte-Carlo Rally, Grand Am, the Dakar or the start of F1, Nascar, GT... the off-season doesn't exist anymore for numerous drivers... and the 2006 season has already started. On the safety side, 2006 will be remembered for the SNELL SA 2005 standard application (which is the most well-known helmet standard worldwide) and the brand new ST3000 racing suit introduction, resulting from the extensive Heat Stress program started in 2003. After its success in testing with 5 drivers in different series (DTM, ALMS, classic races...), its reputation has been established at the PRI during its "official presentation" and it has already convinced numerous teams and drivers. It is the first and only breathable racing suit in the world. Find out all about this revolutionary suit and all the new Stand 21 items in the 2006 Stand 21 catalogue avilable early January in the Stand 21 distribution network. - PRI (Orlando, U.S.A., December, 14th to 16th, 2005), 8 team members devoted to you at the world's largest motor show. - Birmingham Autosport (January, 12th to 15th, 2006, Stand #9420, Hall 9) - Come and meet one of our 8 team members. - Liège Belgian Motor show (February, 3rd to 5th, 2006). - Coventry International Historic Motorsport Show (February, 24th to 26th, 2006). - Roma International Council of Motorsport Science (ICMS) (January, 12th to 15th, 2006), as a Heat Stress conference participant. - Daytona 24 Hours (January, 4th to 7th, 2006 practices and January, 26th to 29th, 2006 race). 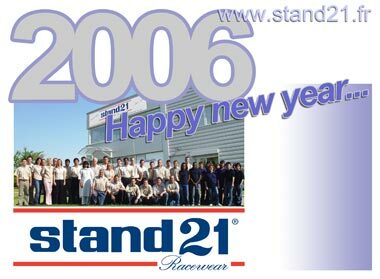 THE 2006 STAND 21 CATALOGUE IS HERE!!! You can order your 2006 catalogue here. All of our helmets are now Snell SA 2005 standard homologated (see "Standards" section). A green-grey visor has been added to the Stand 21 helmets range. Good news for all drivers who suffer from heat: the ST3000, the most breathable, fire-resistant racing suit, is available. After several tests with professionnal drivers worldwide, we give you this exclusive pairformance® , stretchable and breathable fabric racing suit. Like every Stand 21 racing suit, it is 100% customizable and will be available in 13 colors. - All Stand 21 helmets have passed the SNELL SA 2005 standard, the strictest standard in motor racing. 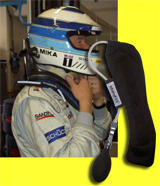 - The FIA has established a procedure to check the Hans® post anchors on helmets using the Hans® system. Stickers are put directly on the shell, the manufacturer being the o nly one authorized to stick them after the post anchors assembly. Post anchors must be FIA engraved and Hans® tethers must have a specific standard marking. Since January, 1st, 2006, stickers, engraved post anchors and marked tethers are compulsory in F1 world championship, FIA GT, WTCC and for WRC factory drivers and co-pilots. "From January 1, 2008, an FIA-approved head restraint (HANS) will be mandatory for all drivers and co-drivers in all FIA championships, trophies, cups and challenges. From January 1, 2009 it will be mandatory for entrants in all other events entered on the FIA International Sporting Calendar. For cars, in which for technical reasons it is considered impracticable to fit the FIA approved head restraint, it will be possible to apply for a waiver to the FIA Safety Commission." - We remind you that for a better Hans® use, adapted to your needs, we can supply an effective air padding system, which has been adopted by many drivers worldwide. Our R&D department is working on a new large helmet that should be available in mid-2006 and that should fit drivers who have a head circumference between 58 and 65 cm. - We are currently finishing our FIA 8856-2000 standard gloves development. There will be 2 models: one will still use leather in areas specified by the new standard (Daytona gloves) and the other one will be made entirely with fire-resistant fabric (outside seams gloves II). - As the new standard has been established, FIA 8856-2000 gloves durability and grip is decreased compared to the FIA 86 standard gloves (this standard is compulsory in F1, WRC and FIA GT only). BENEFIT FROM THE BEST LEAD TIMES FOR MADE-TO-MEASURE PRODUCTS!!! Right now it takes around 15 working days for a made-to-measure and/or customized helmet. Racing suits manufacturing takes around 10 to 15 working days. Stand 21 is glad to present you its new exclusive distributor in Greece. Sébastien Loeb and the whole Citroën team for their tremendous season in WRC. Nelson Philippe who has been ranked with the best progress in ChampCar. Laurent Aïello, a master of driving, who has decided to retire after a great 2005 season, Garry Paffett and 95% of the DTM drivers who have trusted Hans® engineered by Stand 21. Rollcenter for their consistency and their 4th place in LMES LMP1 and Création Autosportif and Jota teams who battled for the win on numerous occasions. Congratulation to Courage compétition, to the Paul Belmondo Racing, to Horag Lista Racing, to Noël Del Bello, ΠR Compétition teams... for their great endurance season. Almost all the Formula 1 field who uses our Hans® new generation. Gabriele Gardel for his GT FIA title with Larbre Compétition as well as Michael Bartels and the Convers and Konrad Motorsport teams. Emmerson Fittipaldi, for its tremendous fight against Nigel Mansell in GP Masters and his talent. Nick Mason, Pink Floyd's drummer and Vintage race driver, who wears our products anywhere as shown on these photos. Bruno Saby and Michel Perrin for dominating the Rally Raid World Cup. A1GP Portugal and Holland teams who are constantly battling for points in this motor racing world cup as well as the Pakistan team members who have proven their talent. Nico Rosberg for his superb GP2 title. Alfa Romeo and Seat teams who battled in WTCC. Patrick Pilet who was out the World Series by Renault for financial reasons and who scored points in every race he ran after his come-back, even reaching a podium during the last meeting. Congratulation to Simon Pagenaud and Ryo Fukuda who did great in this championship. Matt Neal and Yvan Muller who gave us a fantastic BTCC season. The Bornhauser / Thévenin team , the IMSA Performance team and Anthony Beltoise for their performance in Supersérie FFSA as well as SG Formula who dominated the French Formula Renault 2.0. Marcos Ambrose and Todd Kelly, always great in V8 Supercars. As well as all our customers and Stand 21 equipment users worldwide!!! Do you like this newsletter? Register your friends to receive a copy! The 2006 catalogue is out. Order it by filling this form.